Listen to the stories of generations who lived in the 1930s and earlier and you will hear tales of life without 'Electricity.' Coal ranges for cooking and heating water, coppers that were heated and used to wash the clothes. Ice chests and 'meat / food safes' to keep food stored, plus the many 'kiwi' inventions for helping prolong the useful life of food products. Electricity had come to Thames before the Coast, the wait must have seemed endless! From the early 1900s, changes happened at Thames, which would greatly impact on the lives of the residents. In previous years a few had known the wonders of gas, for lighting and other purposes, but the following years brought the introduction of electricity for domestic and industrial use. Thames Hospital for instance, had electricity installed in the surgical area from 1902 and in the remainder of the hospital by 1914. These early power supplies were provided from private generating plants. 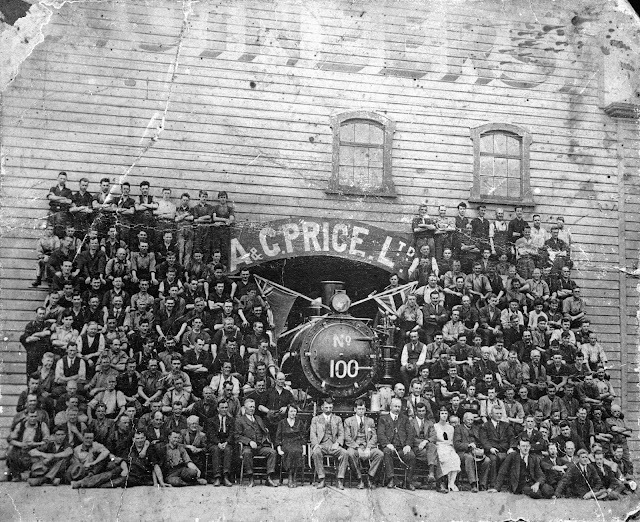 From 1906 the town debated whether to adopt a hydro power option as opposed to what was offered by the Thames Gas Company - it took until 1912 for the green light for the first option to go ahead. Thames Star 4 September 1944. Domestic consumers slowly came on board to the use of electricity in their homes. In June 1914 there were 87 consumers connected to the mains. It proved popular with businesses who changed from their old gas supply to electricity. 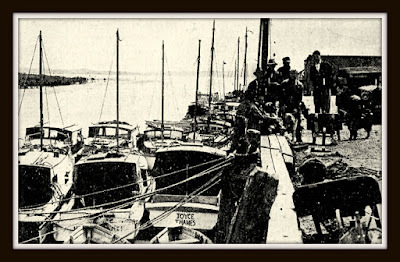 By February 1920 the number of connections was 672. Electrical supply was initially from dusk to midnight, with two extra hours on Tuesdays for domestic ironing. Reports in the paper, informed the residents of Thames of the benefits of electricity and that it was cost effective. Initially many felt it was going to be too expensive and also didn’t know about the wealth of uses that it had, apart from lighting. This was a big learning curve for the community as a whole. Thames did have limited gas street lighting prior to the municipal electricity supply. Once electricity was available, there was a rapid increase in the number of street lamps around the Borough. By 1916 there were 91 lamps, with a further 10 on the boundary line of the County and Borough. The total yearly cost being: £328 2s 4d. For further information on Thames Power - visit the Thames Bella Street Pumphouse. It was the photo below that reminded me about the story of the power coming to the Thames Coast. While the photo itself shows a general beach scene it is the poles along the beach that intrigued me most. As a child driving down the coast, I was often amazed at the poles in the sea! Now if the photo date is genuine, the maybe these lines were in preparation, or more likely for the telephone / telegraph service. 1933 October: Mr Watson convened a meeting at Thornton Bay with the Thames Valley Power Board and the Thames County Council to discuss the proposal to get power from Thames to Waimio [sic]. It was decided to canvas the coast residents as to the question of installation - the proposed cost was given as three thousand pounds for the project. 1937 August: Further meetings of residents were held, now the people at Te Mata wanted to be included in the plans for electricity supply. Again a canvas of households was to be undertaken. The cost now was over five thousand pounds for the scheme. 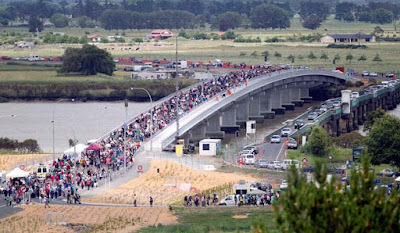 It was reported that there were 189 ratepayers and ten residents in the area. Sixty-seven people had replied to the canvas - fifty-three of these had signed up for power. Another seventeen had signed up the day of the report. 1938 May: Further canvas undertaken to see if there were enough people on the coast to warrant installation. The Chamber of Commerce agreed to make up any deficits regarding the costs for reticulation to Tapu, Thames Coast. 1938 October: Bad news, the plan for power was running six months behind schedule. 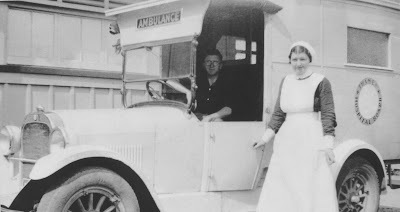 Engineer Mr N G McLeod told the Thames Valley Electric Power Board meeting, "Owing to the rush of work and the fact that other lines were signed up and the whole lot of the constructional staff was engaged on services elsewhere." Thames Star 6 October 1938. 1939 January: Thames Valley Electric Power Board reassured the Thames Chamber of Commerce that work would soon begin on the reticulation of the Thames Coast Road with electricity. During the installation period, the unrest and war in Europe led to limited supplies of items such as switches. 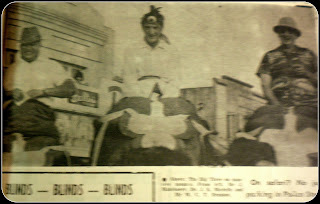 1939 December 10: Red letter day - POWER TO THE THAMES COAST! Lucky residents up to Te Puru received the first electricity supply's and right to Tapu was due in the near future. Electrical appliances, lighting and hot water services were now available to the Thames Coast residents. 1941 January: Now the coast had power, it was foreseen that things would rapidly change. Holidaymakers were overwhelmed by the provision of electricity at resorts and felt it would help popularise the coast (if only the road could be tar-sealed as well!). 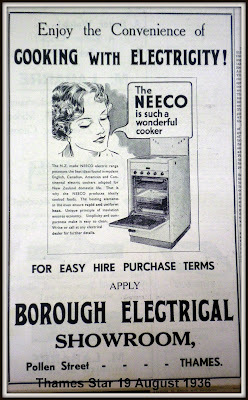 1936 Electrical Appliances available at The Thames. BELOW: Date not known but should be early 1900s - taken from the hill coming into Waiomu, looking back to Te Puru. Poles can be seen along the hill and road. BELOW: Closer look below at the 'poles' at Te Puru. 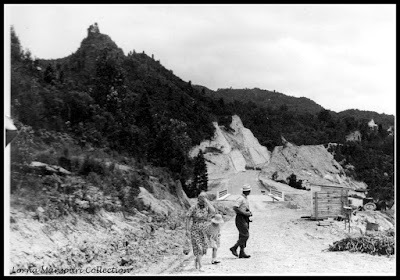 BELOW: 1970s view looking south back at Te Puru... Electricity and Telephone poles venture into the sea! 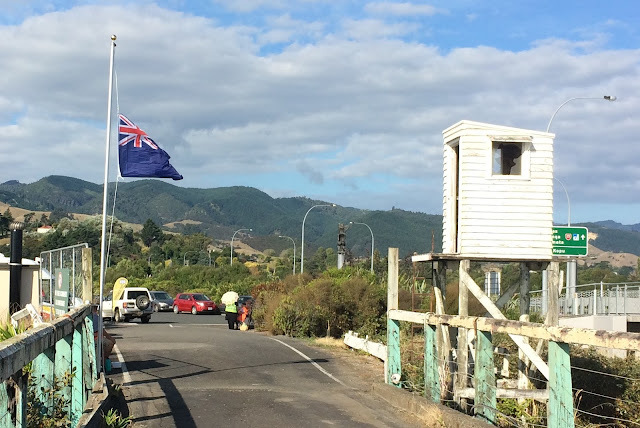 While sadness descended over the town following the horrific events in Christchurch, people have stopped at different prayer and vigil events to Stand and remember. 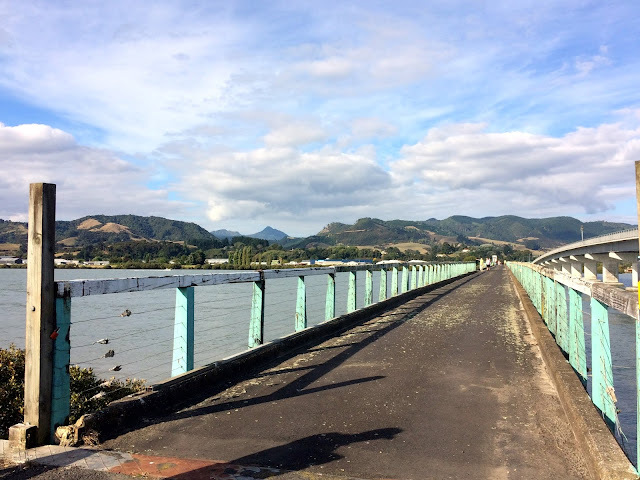 The east end of the old Kopu Bridge. Heritage Events for Sunday 17 March 2019. Thames Union Church - Heritage Church Service 10am start. All Welcome, dress up welcome. Poetry Reading & talk 'Development of Safety Bicycle' plus launch of the Thames Vintage Ladies Poetry Group's first booklet of poems. Thames Museum open - Transport Display and guided tours. 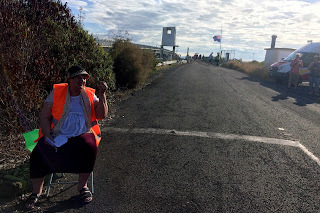 East end of the Kopu Bridge, Anne (left) gives the safety briefing, while Kim (right) greets walkers at the entrance to the bridge. 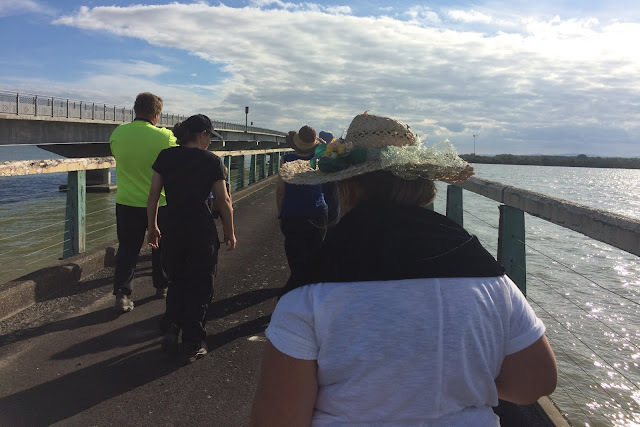 Walkers begin the walk to the west end of the bridge. 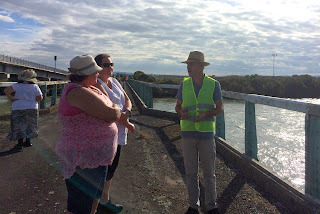 Russell (far right) tells tales of the bridge, while standing in one of the old parking bays. Above & Below: View back along the bridge to Kopu - a long way! Thamesites were by the 1900s spoilt for choice regarding transport options. 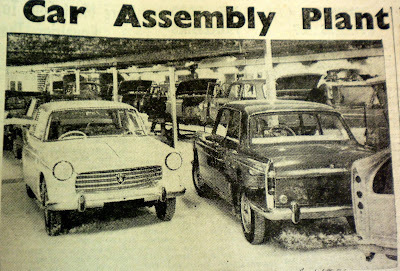 Here is a pictorial timeline of the changes in travel around the town of Thames. · C1902-1904: First Cars seen at Thames Mr A H Brookes had the honour of bringing the first car Thames in February 1902. There are accounts of early 1900s trips around the Thames area. 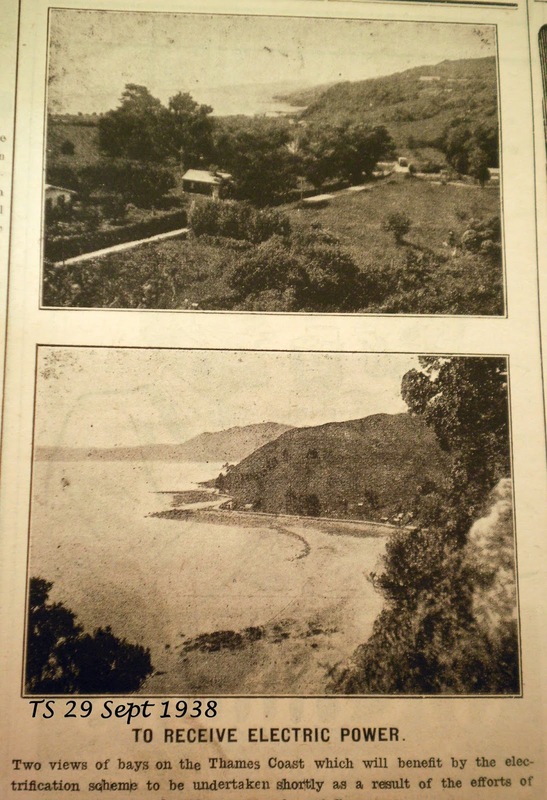 In 1904, Mr J Adams travelled from Coromandel to Thames in 3¾ hours. A distance of 43 miles, travelling at an average of 13 miles an hour! 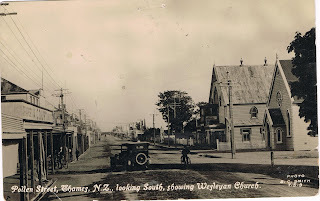 Then in 1905, there was delight when Mr and Mrs Myers came to town in their car, after a trip to Rotorua. Their handsome car reportedly had met with much attention all along the way! All transport options c1910s Grahamstown end of Pollen Street. 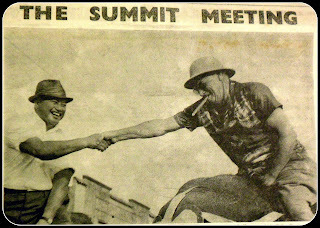 Auckland Libraries Heritage Collections 35-R1460. In May 1900, a motor cycle was seen in Auckland. 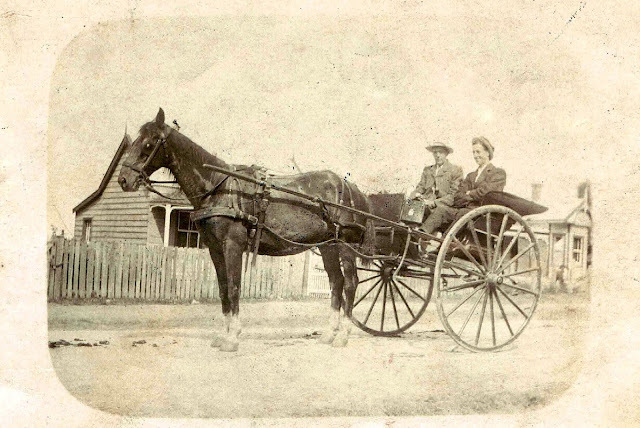 It was described as having a speed of four to thirty miles an hour. There was ONE motorcycle in Thames in September 1903, the paper wondered why this improved method of transport had not caught on, in Thames. Service Car waits to collect passengers from the Wakatere at the Burke Street Wharf. 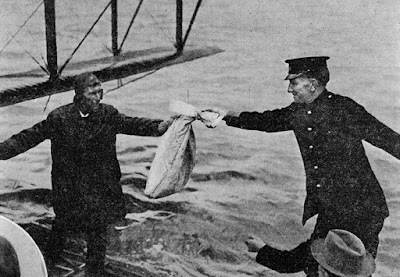 George Bolt receiving mail from a Post Office Official for the first airmail flight from Auckland to Thames. Sir George Grey Special Collections, Auckland Libraries, 7-A6252. · 1922: First Airmail Newspaper Service. An honour that Thames shared equally with Whangarei, when the first seaplane newspaper service in New Zealand took place on Friday 8th December 1922. The First Seaplane Newspaper Service in The Dominion: Last Friday's Issue of The New Zealand Herald, containing results of the General Election, being transported by air to Whangarei and Thames at 4 am. Sir George Grey Special Collections, Auckland Libraries, AWNS-19221214-38-2. · 1924: Concrete road strip down Pollen Street. The concrete not only signalled better driving but was seen as a boom for the town and signalled that better times were ahead. 1937 view of Pollen Street, showing the 'concrete strip'. 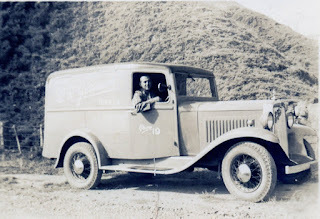 Auckland Libraries Heritage Collections AWNS-19371124-49-3. 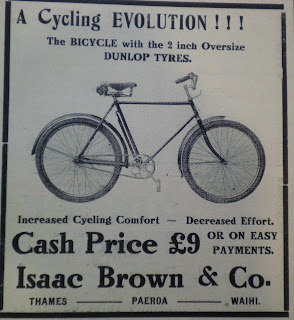 · 1930s: Advances in bikes. 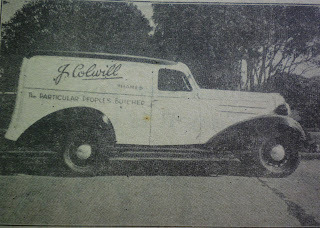 Colwill's Butchery Delivery Van (left) and Gleeson's Bread Van (right). 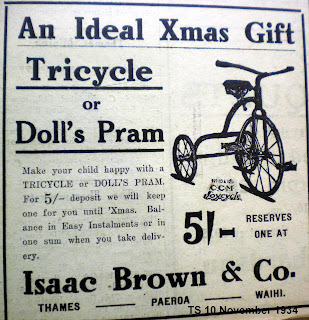 New Zealand Herald 21 December 1938. Length - 17.17 miles (28.5 km), Original formation width - 27 feet (8 metres), Steepest grade - 1 in 10. Bridges - 7 with a total length of 950 feet. The longest 163 feet and the shortest 109 feet. Distances from Thames to Hikuai: Prior to the Highway - 53 miles, using the Highway - 22 miles. As the crow flies - 13 miles. Completed cost - £1,080.000. 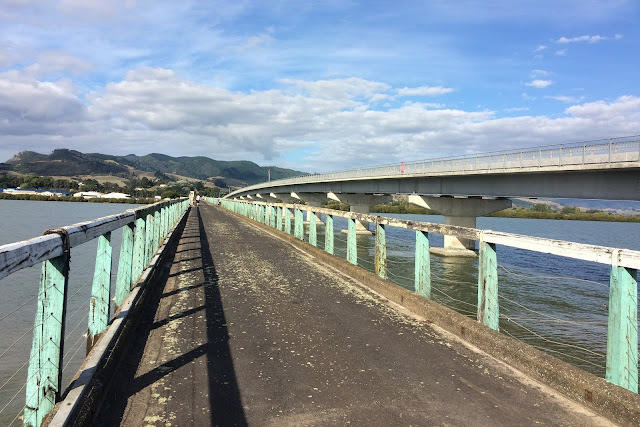 Old and new Kauaeranga Bridges. What's next? 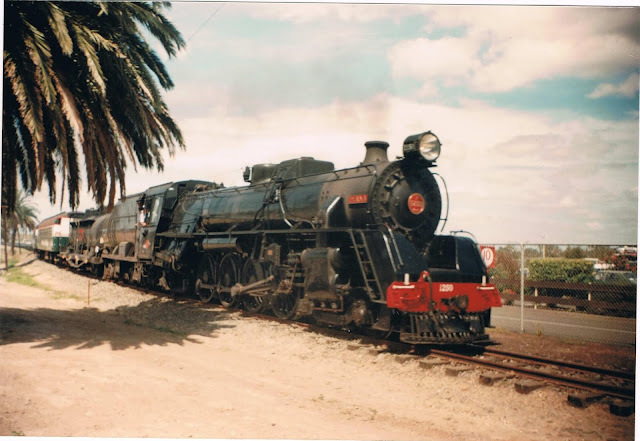 Maybe we will get our trains back! Was it a generational thing, or was it that our Thamesites were never prepared to be beaten? Nothing seemed to hard! Want to move a building? Just say where to and it would be done! Not to forget the moving of large / heavy mining equipment, that was achieved on a regular basis. 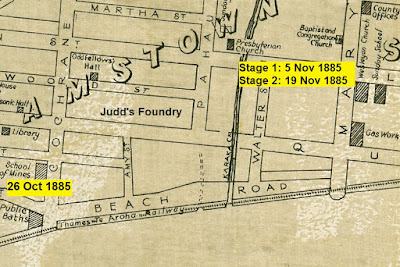 There are a few reports of buildings being urgently removed to the goldfield, and the most accepted story is that the Wharf Hotel was ferried across the gulf from Auckland. There is no evidence to suggest that this is true, in fact the opposite is true as there are reports in the paper describing the erection of the hotel building at the corner of Albert and Brown Streets. 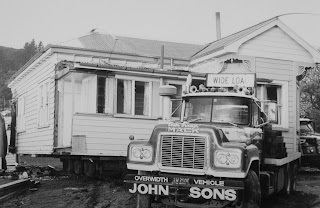 Around the town, the most common method to move a building was to literally put the structure onto skids / rollers and slowly move the building to the new location with bullock teams. 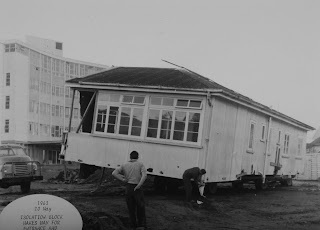 The photo below is from North Auckland, but shows the principal of moving buildings that was employed at Thames in the early goldfield years. Showing a bullock team moving the Aranga hall to be near the Aranga gum camps. It was moved again in the 1990s to the Aranga School. 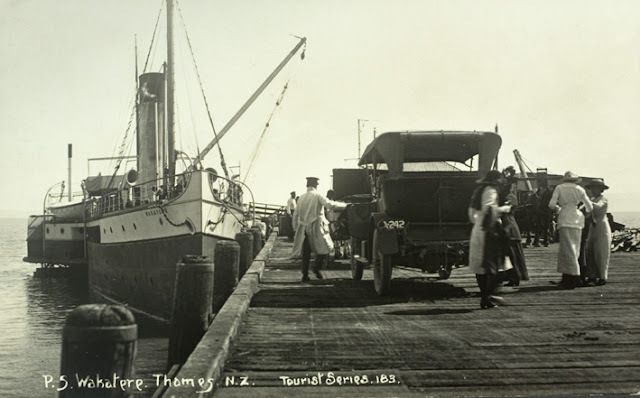 Auckland Libraries Heritage Collections AWNS-19220817-41-3. 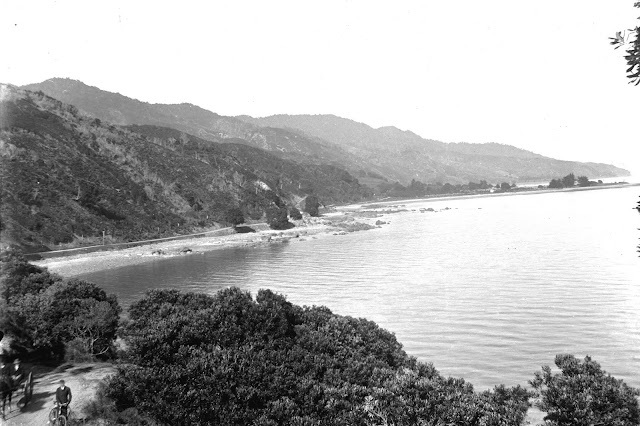 Built for Robert Graham in 1868, moved to Waiwera about 1875. Sadly no photograph yet found of this, like all the other early building moves! The first St George's Church was built in Rolleston Street in May 1868. 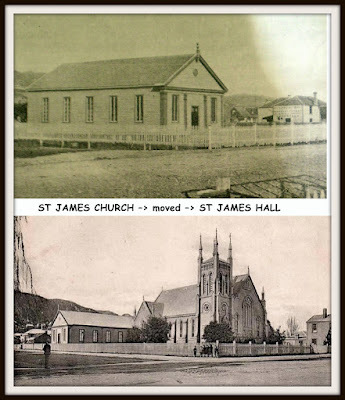 (below left) Within a few years a new church was built and then in 1909 the 'old' church was moved to the present church site in Mackay Street - where it is still used as the Church's hall (below right). The first St James Church was located at the corner of Rolleston and Sandes Streets 3 May 1868. The second church (below top) was opened 29 January 1871. 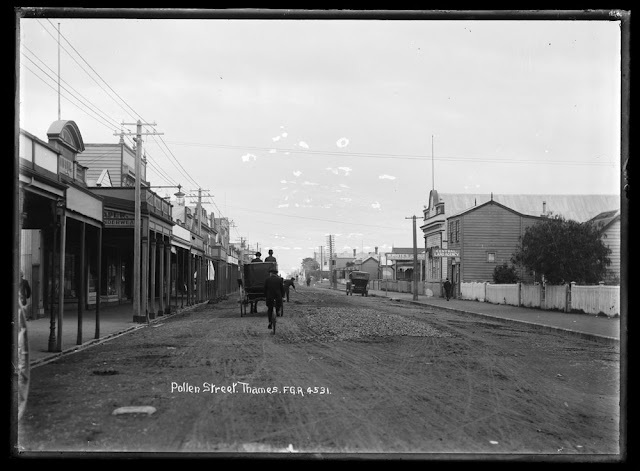 When it was decided to build a new church, this second church was moved east on the section and turned 90 degrees to face Pahau Street (c1897). This 'old' church is now used as the church hall. 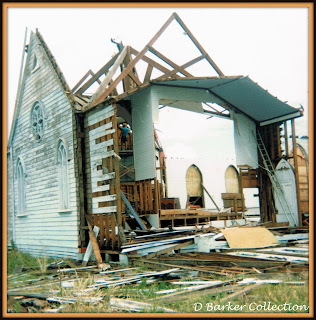 1885, Oct 26 Mon: Six hands started this morning to get the Church divided into two parts, and bolting 6x4 under the center stringer and side wall plates to skid it on. Tues 27: Got all ready to pull out side-ways on to the road with two winches. Wed 28: Got it out on to the road side-ways about 50 feet, and pulled it end on about 150 feet, with ten hands. Thur & Fri 29/30: Got as far as Judds. Three more hands started. Tues Nov 3: Got into Mary Street with(?) the Church Front part, 13 hands on this week. Wed 4: Just got into the Ground this evening. We shifted it on sleepers 6x4 packed up leveal (sic) and well greased and pulled it along with a winch and one pully with a rope leading to the winch. Everything as worked very well so far. Thurs 5: We got the first section into its place. It has taken 12 men. Fri 6: Started to take down the ? at the back of the other section. Sat 7: Still on with the apes and vestry. Wages for the week about 35 with the cart. Mon 9: Got the apes of and the skids bolted under and also braced the roof a bit better. We lost 1 hour through (?)wind. Tues 10: Started to shift the second (sic) section got it turned end on to the road ready for a straight pull. I lost ½ hour weather. 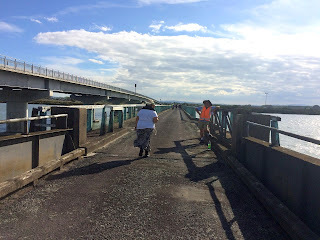 Sat 14: Got as far as the Kraka (sic) Bridge. The wages and sundry expenses amount to about 30 pounds for the week. Mon 16: Got on very well shifted it about 100 yards. Thurs 19: We got the seckoned (sic) section in its place. We have had 12 hands on altogether shifting this peace (sic). Sat 21: The wages for the month for shifting the church is about £130. From Nov 23 to Dec 5: Four men been on shingling for the fortnight and finishing cost about £20. Mr Horn gave a summary of the costs and put the total contract at £373. Map showing how far the Wesleyan Church was moved. There are many more buildings that were demolished and moved, or partially demolished in order that they could be more easily transported. 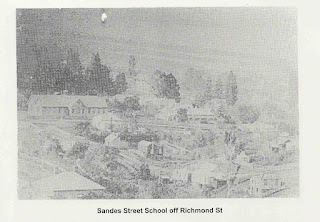 This includes the Waiotahi Creek School and part of the Baillie Street Boys School - details record they were moved, but not where they ended up. Part of the Baillie Street School does remain on the Thames High School site. Several people have claimed to have had buildings from Thames, but they have not been formally verified. This includes a hotel at Opotiki that is meant to have come from Thames - but it hasn't been identified back to Thames (as yet). 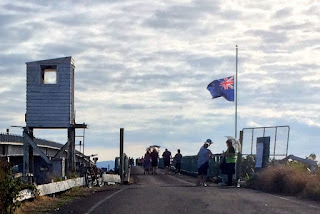 One of Thames' most special landmark buildings was dismantled, restored and now has pride of place at the Auckland War Memorial Museum in Auckland - namely the Meeting House 'Hotunui'. The meeting house Hotunui fell into disrepair over the years and in 1925 efforts were made to restore some of the carvings. After negotiations another option became available and the meeting house found a new life at the Auckland Museum, restored at the museum, where it went on display in 1929. We couldn't finish without mention the moving of our largest products. While the great kauri tree were cut and travelled down the Kauaeranga River, where they were often tied together as a raft and towed by boat to Auckland. Thames Hospital has moved multiple buildings over its 150 years of existence. from an old morgue building (now at Goldmine Experience), to an old person's home, isolation block (below right), and old staff residences (below left). What about a lighthouse! Chas Judd Ltd, the foundry on Queen Street, made some magnificent lighthouses that were then transported to a ship and taken to their destination. They would be partially dismantled for the journey! But it still was an amazing fete. In more recent years, Part of Judd's workshop and an old battery have been transported to the Hauraki Prospector's Goldmine Experience property in Queen Street. These are just a few of the many Thames buildings that have 'moved', and we haven't even got to residential houses. Not forgetting the town's beloved Red Pillar Boxes, that have been moved about the town! 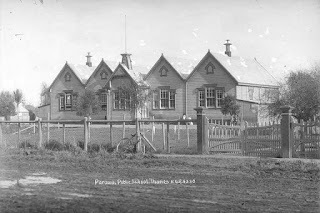 Also the Plunket Rooms built in 1933 was moved to the Hauraki Plains in 2000. It is the early pre 1900 'moves' that are the principal focus in the above blog - they herald the wonderful abilities of our early Thamesites.